Hot water heaters are one of those things that are a real headache if they go out. It's an unavoidable expense when you have to replace one, so it pays to do a little maintenance and prolong their life as much as possible. Proper maintenance may also make them operate more efficiently, leading to significant savings on utility bills over time. 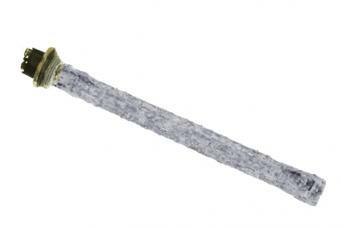 The anode rod is responsible for maintaining a good chemical balance in the water, keeping the tank from corroding on the inside and drastically extending its lifespan. The rods start out smooth and about ½-inch in diameter, but mineral laden water will shorten their lifespan. You should check it at least once per year and replace it if it begins to disintegrate or becomes heavily coated with mineral deposits. You'll need to shut off the water supply to the heater and release a few gallons of water from the drain valve at the bottom of the tank before checking the anode rod. The rod is located on the top of the water heater and can be unscrewed with a crescent wrench or channel locks. If it needs to be replaced, make sure to wrap the threads with Teflon tape before screwing the new one back in firmly and refilling the tank. This is another life-extending chore that is good practice to do on an annual basis. It also involves draining the tank, so many people choose to do this and check the anode rod at the same time. Before flushing the tank, make sure to shut off the power supply to the heater at the circuit breaker box to prevent damage to the heating element. Depending on where your hot water heater is located, it may be feasible to run a hose from the drain all the way outside to discharge the water. Otherwise, you will have to do it bit by bit in a bucket until the tank is empty. The goal is to flush out the sediment that collects at the bottom of the tank. This is accomplished by opening the water supply valve repeatedly to stir up the sediment, draining the dirty water and repeating the process until only clean water comes out. Once you're done, close the drain valve, let the tank fill and then turn the power back on to let the water heat up again. 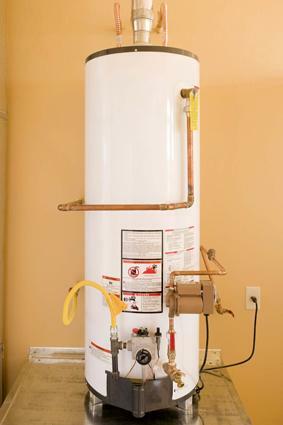 All hot water heaters are equipped with a temperature-pressure relief valve (TPR) that allows water to escape if the unit malfunctions and overheating occurs. The TPR is another replaceable piece of the system that sometimes goes bad and starts leaking long before the hot water heater itself goes bad. If this occurs, you'll have a big wet mess on the floor, but fortunately there's any easy way to check it to see if it's on its way out - the third and easiest part of annual hot water maintenance. The TPR is located on the top or side of the tank and vaguely resembles a hose spigot, except the handle is a thin little piece of metal that is lifted upwards to release water. Hold a bucket under the valve and lift the metal lever upwards until it snaps into a vertical position to release a small quantity of water. Then push it back down to the closed position. If it shuts off completely when closed, it's fine for now. If it doesn't close all the way and water continues to dribble out, go ahead and replace it. Simply follow the same procedure for checking the anode rod - release a few gallons of water from the bottom of the tank, unscrew the valve with channel locks and wrap the threads with Teflon tape when you install the new one. 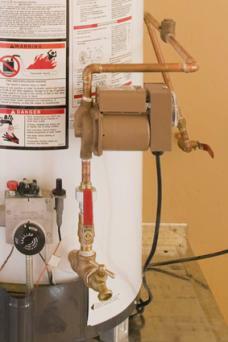 There are a couple other things to consider when doing your annual water heater maintenance. If the heater and the pipes going to and from it haven't been insulated, pick up a water heater insulating blanket and a few pieces of foam pipe insulation from the local hardware store - they are inexpensive and will quickly pay for themselves with the reduced energy demand to heat the water. Just note that gas-powered water heaters should not be insulated on top, only on the sides. You can also check the temperature setting and consider lowering it to further reduce energy bills. The temperature you keep it at is a matter of personal preference, but 120 degrees is a typical setting for resource-conscious consumers rather than the factory-standard 140 degrees. Keeping your water heater in top shape not only saves you money in the long run, it's also one of the little ways that we can all work to conserve resources, reduce energy use and avoid a trip to the landfill. If you haven't familiarized yourself with these basic maintenance tips before, now is a good time to start and then put it on the calendar for next year.